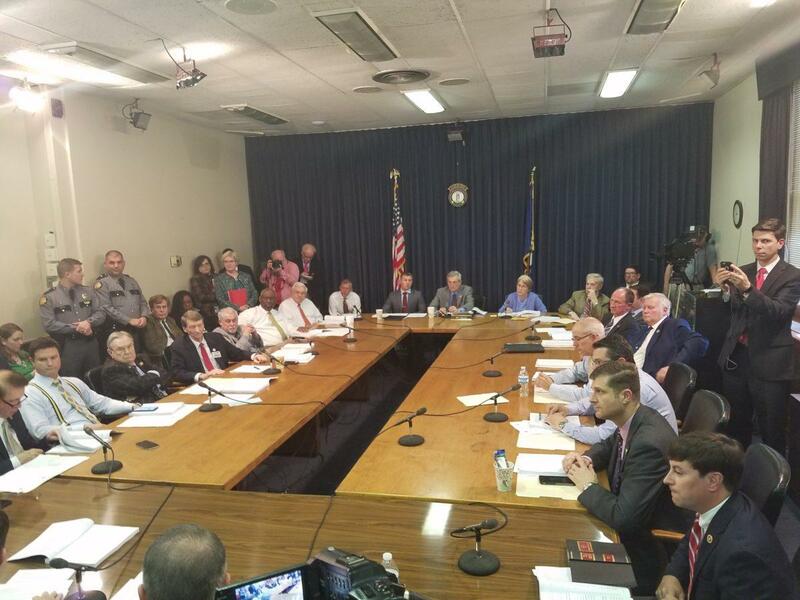 After weeks of saying that a proposal to fix retirement benefits for state workers was likely dead, on Thursday Republican leaders of the Kentucky legislature quickly passed a bill overhauling the state’s pension systems. The legislation, which does little to address the state’s pension debt, was attached to an unrelated bill dealing with governance of sewage districts. The legislation, which awaits Gov. Matt Bevin’s signature, would mostly affect future teachers and other state workers, but also tinkers with the benefits of current teachers and public employees hired over the last four years. Rep. Angie Hatton, a Democrat from Whitesburg, criticized Republican leaders for the surprise legislation. The 291-page bill would no longer offer traditional pension plans to teachers hired after Jan. 1, 2019. New teachers would instead receive cash-balance retirement plans that would invest retirement contributions from employees and the state, and guarantee that the plans wouldn’t lose money during a stock market crash. The bill would also cap the amount of sick leave that teachers can accrue for retirement purposes as of Dec. 31, 2018. State workers hired since Jan. 1, 2014 already receive cash-balance plans, but would no longer receive a guaranteed 4 percent return on their retirement savings. The bill would require state employees hired between July 1, 2003 and Sept 1, 2008 to contribute 1 percent of their salaries to pay for retiree health. The bill would also require the state to put massive infusions into the pension plans over the next 30 years. This year alone, lawmakers have proposed putting $3.3 billion into the systems — about 15 percent of the two-year state budget. The bill has not been reviewed by actuaries to determine whether it would save the state any money. Kentucky has a $41 billion unfunded pension liability — the amount of money needed to pay retirement benefits over the next 30 years. The bill’s sponsor, Rep. Bam Carney claimed the legislation would save the state about $300 million over the next 30 years — a fraction of the total pension debt. Acting House Speaker David Osborne, a Republican, said he hoped pension reform could have made a larger impact on the liability, but there wasn’t the political will to do that. “We listened to the stakeholders and decided that it was more appropriate just do things moving forward as opposed to impacting existing employees and teachers,” Osborne said. The new pension bill does not include a controversial provision that would reduce cost of living adjustments for retired teachers, which was included in previous proposals. Democratic Sen. Morgan McGarvey criticized Republican supporters of the measure, saying it doesn’t save a significant amount of money despite the cuts to benefits. “We’re not passing this bill as a solution. We’re passing this bill to say we’ve done something and get a political win,” McGarvey said. The bill took a hurried path after first being introduced in the House State and Local Government Committee at 2:15 p.m. Thursday. Once it passed, it was almost immediately taken up in the House, where lawmakers debated it for more than four hours amid noisy protests from a large group of teachers in the House Gallery and the Capitol Rotunda. Rep. Carney, a teacher from Campbellsville and sponsor of the amendment, criticized protestors during a speech on the House floor. “We have had grandchildren of members of this body come home crying from public schools because teachers are talking about their grandparents while they’re at school,” Carney said. The bill passed out of the state Senate shortly after 10:00 p.m.
Bevin tweeted out his support for the bill shortly after its passage from both chambers. “Tonight 49 members of the Kentucky House and 22 members of the Kentucky Senate voted not to keep kicking the pension problem down the road. Anyone who will receive a retirement check in the years ahead owes a deep debt of gratitude to these 71 men & women who did the right thing,” Bevin wrote. Fayette County Public Schools announced late Thursday that schools would be closed on Friday because more than a third of teachers called in sick. A large protest is expected in Frankfort on Friday. 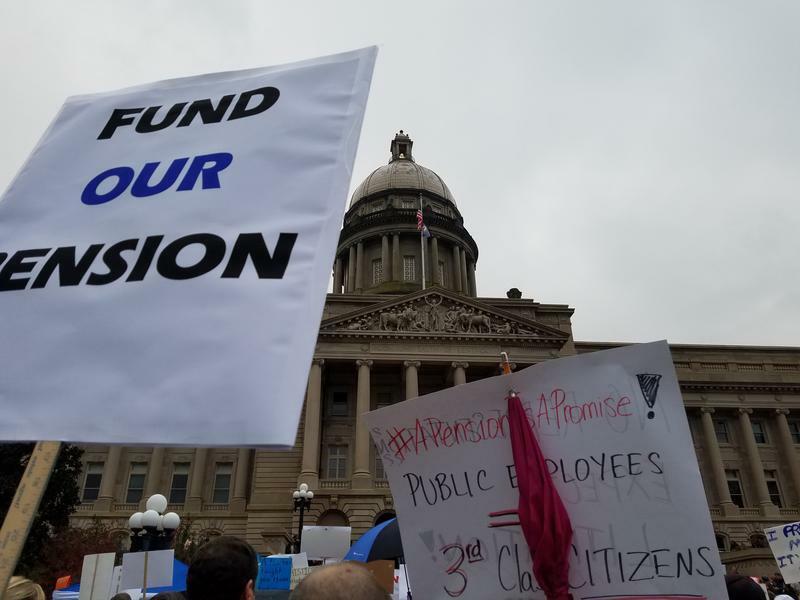 After teachers and other public workers descended on the state Capitol Friday to protest a bill overhauling Kentucky’s pension systems, the state Senate decided to not take a vote on the measure. 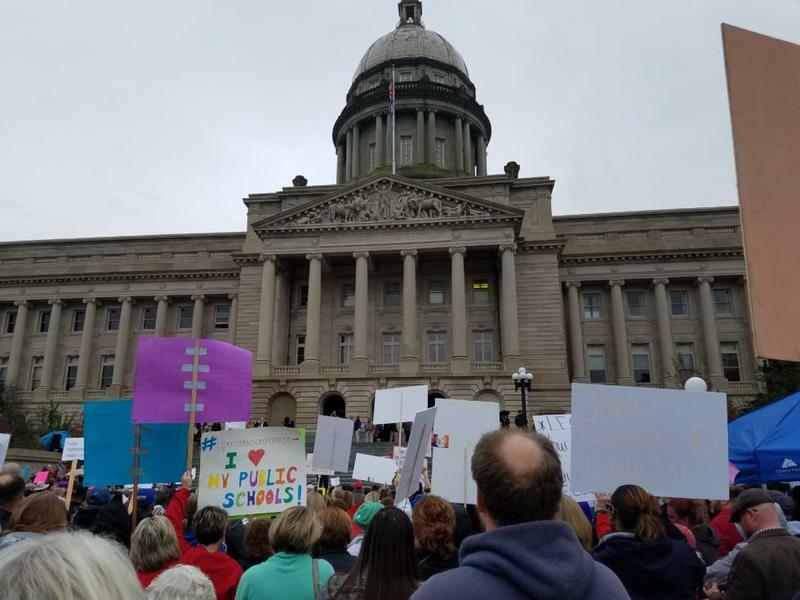 With hundreds of chanting teachers packing Kentucky's Capitol, a vote on a bill that would cut retirement benefits for one of the nation's worst-funded public pension plans seems uncertain.